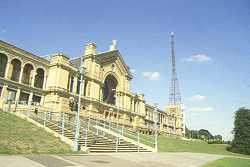 Alexandra Palace was built on top of a hill with the Alexandra Park on three sides. 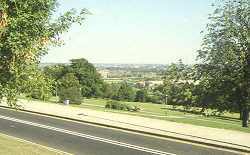 As is well known, the location was chosen as being the highest in London - and the cheapest to acquire. 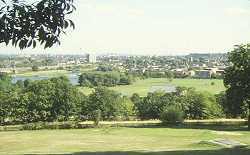 It was either Norman Collins or Cecil McGivern or even Cecil Madden, I can't remember which, who used to say that his office in the tower had the finest view in London, and it certainly did. These pictures were taken in September 1996, and the view is still superb. 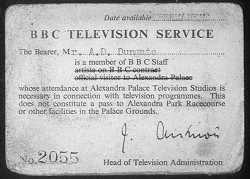 The Bearer, Mr A.D.Dungate is a member of BBC Staff whose attendance at Alexandra Palace Television Studios is necessary in connection with television programmes. All rather grand, but I really don't think that if I'd failed to turn up one day the whole Television Service would have crashed.....! 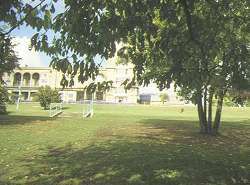 A little way down the grass slopes of the Park from the front entrance to the studios, an enclosed space was used as the Television Garden. The cameras from Studio A were taken outside and the cables run under the road in ducts. Free from the limitations of studio lighting, with plenty of daylight available outside, the Emitron cameras could produce remarkably good pictures. 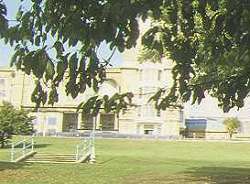 From here, when the weather was nice, came the early gardening programmes, with Fred Streeter. 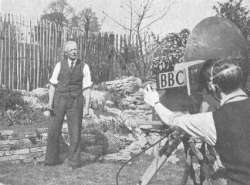 He had succeeded C.H.Middleton who had pioneered gardening programmes in the 1930s on the radio and on television. Today no trace remains of this pioneering tv garden. Even the ducts have disappeared following the re-surfacing of the road and sidewalk. But they may still be there buried underneath!